Case is approx. 23mm X 28mm less stem. Black face but otherwise same as pictured in 1960 ad here on site. Running condition. I think another nice one. Terry, can you post any supporting evidence that the model is a Webster? I believe it is the one on the far right top, Model # 32763, but black face. 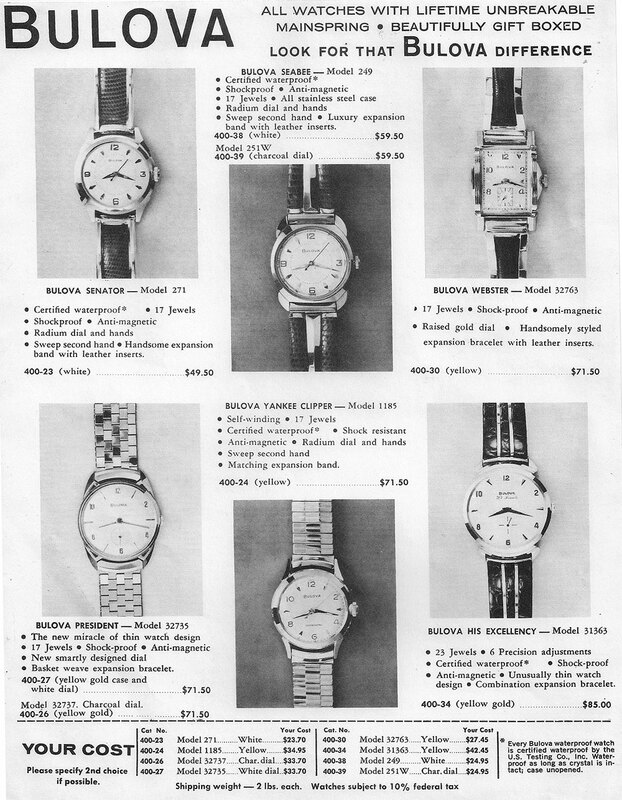 * Note the open bordered Minutes track of the actual Watch Dial matching the open bordered sub Seconds Dial vs the closed tracks of the White Dialed model shown in the adverisement: a recurring trait of Bulova Dials. Open (non bordered) Minutes track / open sub Seconds Dial. Closed (bordered) Minutes track / closed sub Seconds Dial. Thanks for pointing that out! I have much to learn. Nice. Good pickup with the ad! I missed that one.